The unique heritage and culture are the basic determinants of Incredible India. The glorious past of the nation is a sure shot allurement for any tourist. The piousness of temples in South India or the exotic beauty of mountain ranges in North India- we pack our tours to cater each and every aspect of both. If you have a quest to unveil the deep buried secrets of the RoopKund Lake in Uttarakhand, avail our North India tours at the earliest. 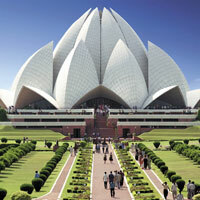 We assimilate all your requirements and provide highly acclaimed packages of Heritage & Culture Tours in India.